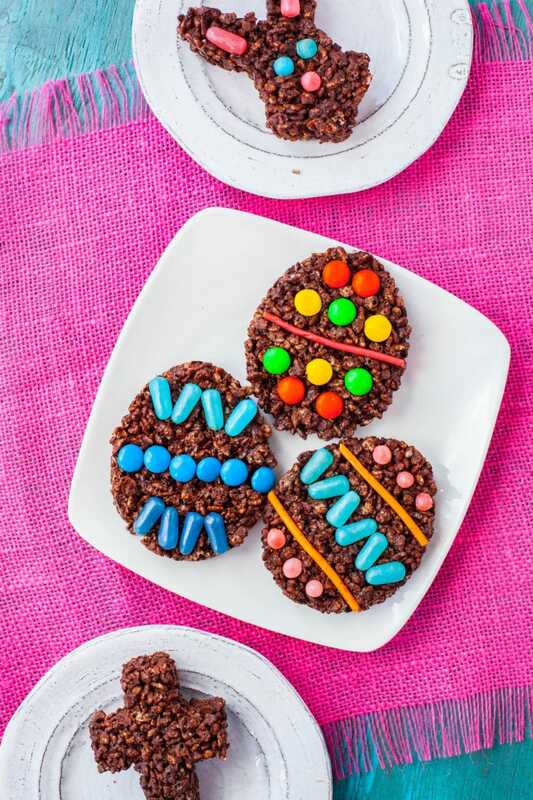 These chocolate Easter Rice Krispie Treats are as fun to decorate as they are to eat, and make a unique Easter dessert. Sometimes the spring feels like a whirlwind, whipping in and out before I even realize it. But Easter is a holiday I look forward to all year long. With the warmer weather and a bit of distance from the busy winter holidays, for Easter I like to spend special time with the kids in the kitchen. Some years we make Easter Bunny Cupcakes, and it’s so fun to turn leftover Easter eggs into animals. These chocolate Rice Krispie Treats are one of our new favorite recipes, and they’re perfect for sharing at spring and Easter-themed events. Make a batch for your family at Easter dinner, or bring a batch for Teacher Appreciation Day or the school spring carnival. 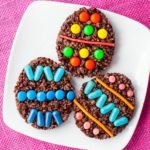 Chocolate rice krispie treats are great for chocolate lovers any time of year, but are extra special when decorated and shared as an Easter treat. 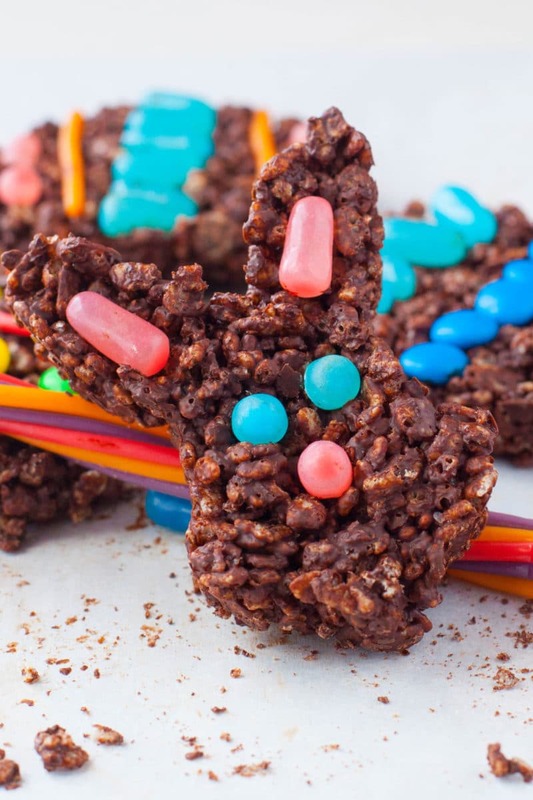 While the traditional recipe uses marshmallows as the binding agent for the cereal, these Easter rice Krispie treats use melted chocolate instead. The result is less cloyingly sweet, but very chocolatey. The best part is that you can choose whatever kinds of chocolate your family likes best and create your own custom Easter dessert. 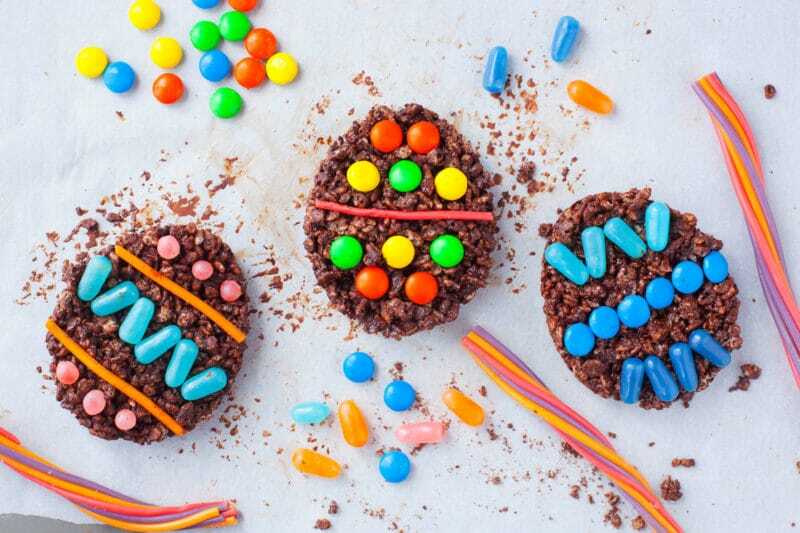 To make these Easter Rice Krispie treats with your family, follow the steps below! Choose your cookie cutters to shape your treats and spray with cooking spray to keep the treats from sticking. We used eggs, bunnies, and crosses for our shapes. Place them on a paper-lined baking sheet. Melt the chocolate. You can either use a double boiler or the microwave to melt your chocolate. To melt the chocolate in a double boiler, put 1 – 2 inches of water in a medium saucepan. Fit a glass bowl over the top of the pan and bring the water to a boil. Add the chocolate and stir periodically and gently. Be sure the water doesn’t touch the bottom of the bowl, or it can scorch the chocolate. This is the gentlest and most foolproof method to melt chocolate. If you prefer to use the microwave, place the chocolate in a glass bowl. Microwave at 50% power for 30 seconds and stir. Repeat until the chocolate is about 90% melted then stir until smooth. Fold the Rice Krispies into the chocolate, being careful not to break the cereal. When well blended, spoon the mixture into the cookie cutters, pressing down lightly to create one even layer of Rice Krispie treats. Slide the tray into the freezer for 10 minutes to harden the treats. Remove the cookie cutters and repeat until you’ve used all of the mixture. Makes about 5 treats, depending on the size of your cookie cutters. My kids and I had a blast decorating our Easter Rice Krispie Treats! We probably went a little nuts loading up on decorations at the grocery store, but we had some favorites we ended up using a lot. 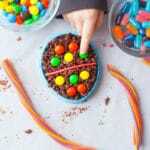 Pull-apart Twizzlers, Mike & Ikes, M&M’s, and jelly beans were easy to use and stuck to the chocolate pretty well. If you don’t want to spend time decorating, you could just make cross shapes. They look great even without candy! We’re thinking about doing this as an activity at a party we have coming up, the kids had so much fun. If you want to use this as a group activity, just remember you’ll need to have enough cookie cutters for people to decorate while some of the treats are freezing. 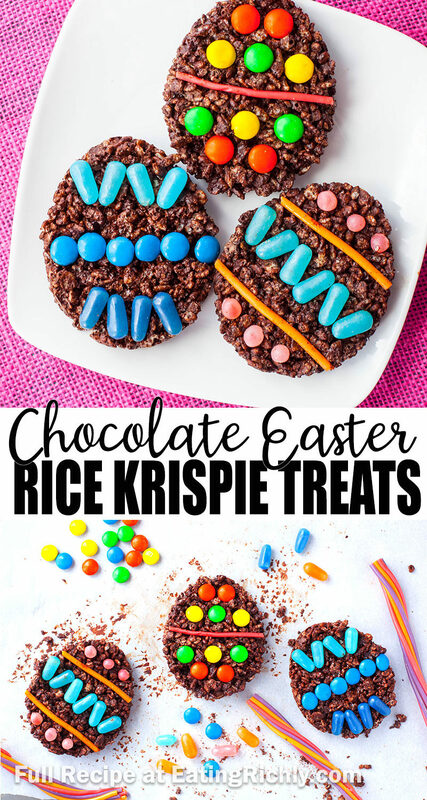 So this spring, don’t forget to include these cute Easter rice krispie treats on your table and get the whole family involved in decorating and eating! LOOKING FOR MORE EASTER CRAFTS? CHECK OUT OUR EASTER EGG SLIME AND PINEAPPLE EMPTY TOMB! Make sure you pin this post so you don’t lose it! Once you make your own chocolate Easter Rice Krispie treats, share a photo in the comments of the pin. We love seeing your creations! 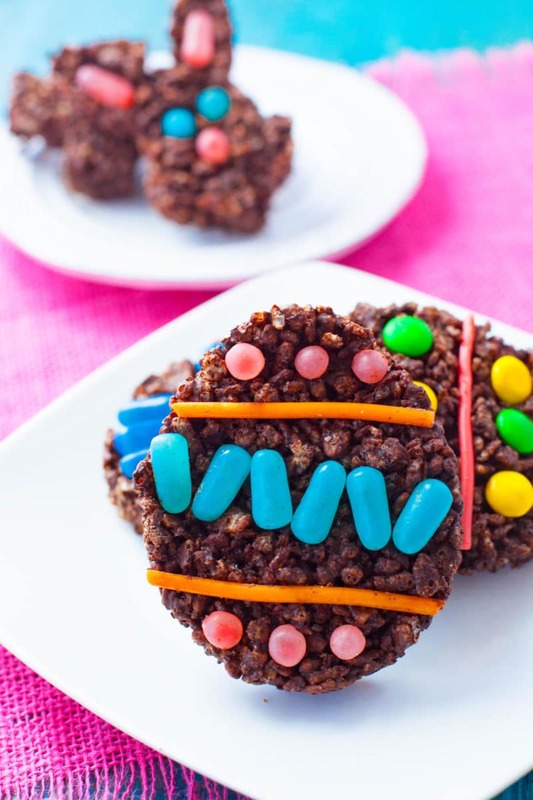 These chocolate Easter Rice Krispie Treats are as fun to decorate as they are to eat, and make a unique Easter dessert. You can use your favorite candies to decorate. We like pull apart Twizzlers, Mike & Ike, and m&ms. Make sure to use gluten free Rice Krispies and/or dairy free dark chocolate chips if needed. Choose cookie cutters in the shape you’d like and spray with cooking spray. 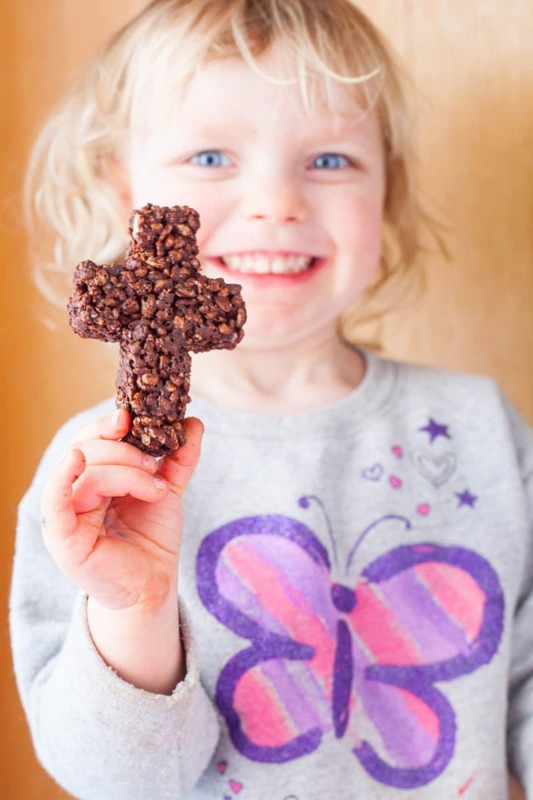 We used eggs, bunnies, and crosses for our Easter Rice Krispie treats. Place cookie cutters on a baking sheet lined with parchment paper. Melt the chocolate (see notes for melting instructions) and gently fold in the cereal. Spoon the chocolate Rice Krisipies into the prepared cookie cutters and press into an even layer. 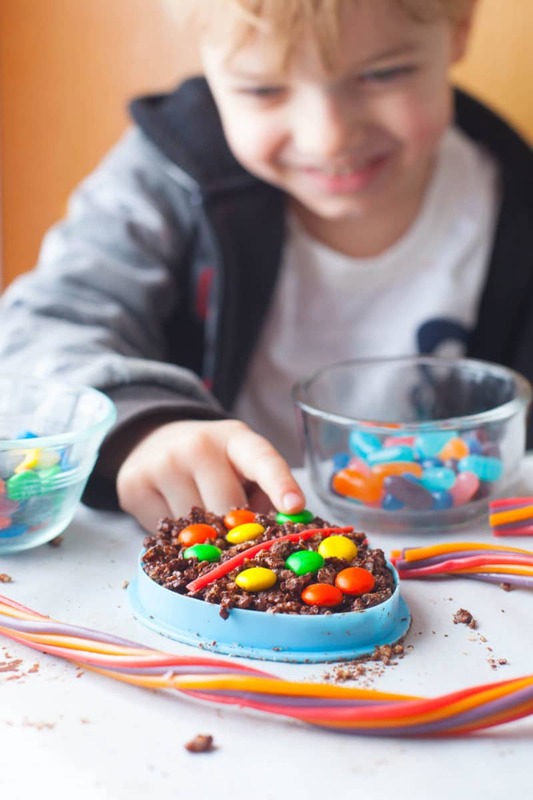 While still in the cookie cutters, decorate the Rice Krispie treats with candies, pressing them in. Place the baking sheet in the freezer for 10 minutes, to slightly firm up the treats. Gently push treats out from cookie cutters and let them finishing firming up at room temperature. You may spray the cookie cutters to use them again for more treats. NUTRITIONAL VALUES: Nutritional values are an estimate only, and do not include the decorating candy. Make sure to add the info of whatever candies you use.